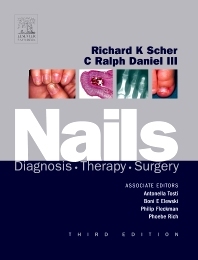 The thoroughly updated 3rd Edition of this highly regarded text continues to provide the latest therapeutic and surgical information on nail disease. A new signs-oriented section guides you to disease-specific information and simplifies diagnosis. The new, streamlined format includes bullet lists · cross-references · "Therapy" and Key points" highlights for easy reference · and full-color artwork throughout, as well as a larger page size that accommodates bigger photographs. In addition, many illustrations have been added to elucidate complex basic science. Provides the most reliable and comprehensive treatment information available—fully revised to include the latest therapeutic and surgical knowledge. Uses a disease-oriented chapter format.